It’s always fun to design a project which seems to have lots of interest. 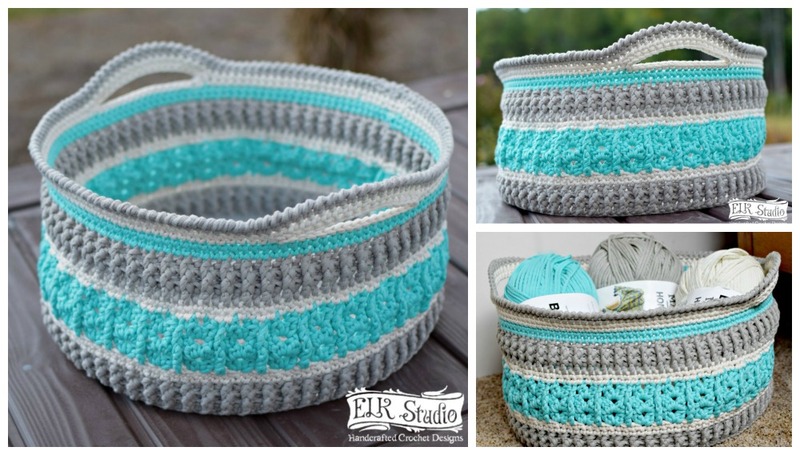 The Sea Glass Basket is a fun project using the Bernat Home Decor Yarn! You love how the bulky yarn just slides so easily through the hook! The textured stitches along with the millinery wire used in the bottom and top of the project will also help hold the project’s shape. I hope you’ll enjoy the pattern! Ch 1 is not considered the first st unless otherwise stated. Ch 3 is considered the first dc in the project unless otherwise stated. You can work the bottom of the basket in a continuous round or join by sl st. Whichever way is the easiest for you. I will be writing the instructions for join by sl st.
You can see the second part of the basket by clicking on the MAIN PAGE! Round 19: Ch 1, sc in front loop only in first st, sc in front loop only in next st and each rem st around, join by sl st to first st. Round 20: Ch 3, (See Pattern Notes), dc in next st and each rem st around, join by sl st to top of ch 3. Round 21: Ch 1, fpdc around post of first st, bpdc around post of next st, *fpdc around post of next st, bpdc around post of next st, repeat from *, join by sl st to first st. Round 22: Repeat Round 21. Fasten Off. Weave in the ends. Round 23: Join Cream, Ch 1, sc in first st, sc in next st and each rem st around, join by sl st to first st. Round 24: Repeat Round 23. Fasten Off. Weave in the ends. Be sure to look for the remainder of the pattern to come out next week! Don’t forget to Watch the Tutorial on Adding Wire to a Project! I’m sorry but I’m so confused. I have got the wire in and have done all the way through the row of dc. But I was reading the comments and it says the front loop should we did a row in should be to the outside of the basket. Mine is the opposite. Now I am crocheting around facing the inside. Is that corrdct and if not, at what point was I supposed to flip the circle I put the wire in around. Does it really matter. Isn’t basket nothoing to be as pretty cuz I’ll have the inside facing out. I hope you can help me. I think you are talking about Round 19. You were supposed to crochet in the front loop only but if you didn’t or your basket is crocheting as you say to the inside, that’s okay because since you are working in the round and it’s a basket, it won’t matter. Just keep going. Kathy I did crochet in the front loop and it puts the horizontal line in the back. I just assumed that line throws the fabric in a direction that helps it sit up however making that the inside does the opposite. It’s ok though. The basket is coming along beautifully. When I’m done I’ll either leave it like that or turn it. Thanks for the beautiful pattern. I’m really proud, I’ve never done anything like this and it’s actually turning out. Yay!!! How can I find the rest of the project instructions on the sea glass basket? I got the first 24 rnds but cannot access the rest. Such a beautiful basket. I really want to make it. Thank you. Beautiful basket! What gauge wire is the millinery wire you used please? It was 19″ gauge wire. Hi I’m a beginner at crocheting and use u-tube to teach me. I want to crochet your sea glass basket but have to see it being made instead of written. Any chance of showing how to make this basket? I don’t have plans to create a video at this time for the basket. I’ll keep it in mind for the future. I used hemp cord for this project and it worked wonderfully. IT was stiff enough that I only added wire to the top portion so objects leaning along the top had some support. Love it!! I didn’t use a stiffener on my project. It may be that my stitches are tighter. Thanks I’ll try making the next one tighter. Might try to starch the one I already made. This may Sean like a silly question, but I’m a some what beginner… When you say to crochet in front loop, , do you mean as I look at it from what will be the inside of the basket, or what will end up being the out side of the basket. The front loop is the front stitch that is closest to you and the back loop is the stitch closest to the inside of the basket. Does that make sense? Yes it does. Thanks, I sometimes over think things! Love the pattern. I have all the materials. But please where do we find the second half of this beautiful basket? Thank you, thank you, thank you. I hope it turns out as beautiful as yours. Hi Sherry! You will need one skein of each. Absolutely gorgeous colors and basket. Thank you so much! What a beautiful basket, it’s now on my to-do list! The link to the main CAL page goes to a 2015 post, which shows a different project #3. I went to your home page looking for a 2016 CAL post, but didn’t find it? Looks like it’s fixed now Thanks! I love this basket. Making one in turquoise and lavender. Anybody know when the next instructions are coming out? First one looks like it was posted Sept 17. One week would have been yesterday. Maybe tomorrow? Thank you Elk Studios for a very lovely pattern. Is the basket about 12 inches in diameter? The supply list was released last Saturday with the first part of the pattern being released yesterday. The 2nd part of the pattern will come out on the 24th. This is a first for me so I’m telling the world – I have 2 (TWO!) of the Sea Glass Baskets hooked up to the point where I need directions for adding wire! I’m usually bringing up the cow’s tail of CALs, etc. , but not today. Gotta toot my horn when I can! This is beautiful; thanks so much for sharing! I was wondering, how well do you think the basket would hold up without the millinery wire? I think the stitches I’ve used along with the yarn makes it a great basket. It will look great as long as you “fill it” to help keep the shape. The watch tutorial link for adding wire isnt working. Let me check into it. You may have to refresh your cache, but I updated the link and it seems to be working. Let me know if you still have an issue. Thank you! !